If you’re thinking of purchasing a luxury garden room, whether it is to be used to play, work or entertain in, there are plenty of important features that you need to consider, for both style and functionality, so that you end up with a building that you can use, love and enjoy for many years to come. We believe the interior floor is one of the features that should be a carefully considered part of the design process to prolong the life, quality and overall style of your building. Garden building companies offer various flooring types that boast different values and features; and all generally start with a standard option, which is often a hard-wearing timber such as pine. It it is worth doing some research into the type of timber used for your building, as this really is a big indicator of quality and longevity. We recommend that you always look for the FSC® certification and for wood that is slow-grown with a close grain, meaning it is less susceptible to dead knots, to increase strength and life-span. 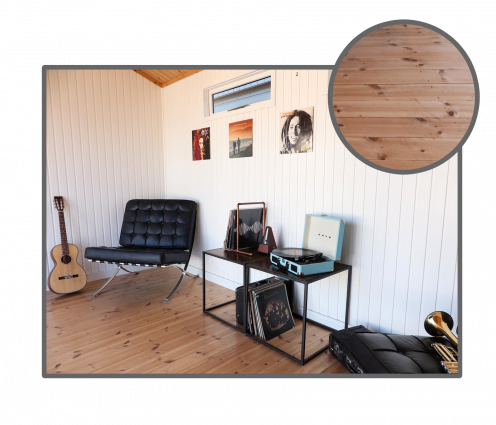 Floor timber is generally planed to achieve a smooth finish and can either go into the building naturally or with a lacquer applied for an attractive sheen. At Crane, we offer various flooring types so that our customers can select the product that is perfect for their requirements. We understand that our customers may be looking for something more individual or to their taste when considering the interior of their building, which is why we offer high-end quality engineered flooring. With both rustic and contemporary colour options available, our engineered flooring allows you to further personalise the interior of your building, depending on your style preference. 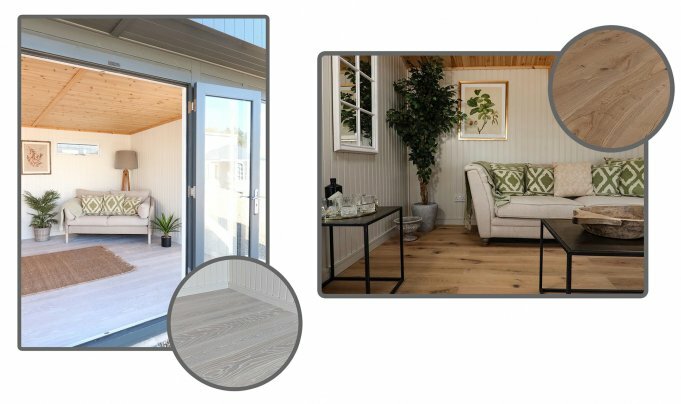 The colour options we offer include the contemporary, light shade of Copenhagen and the classical, rustic shade of Heritage Oak shown above in our Salthouse Studio (left) and Pavilion Garden Room (right). 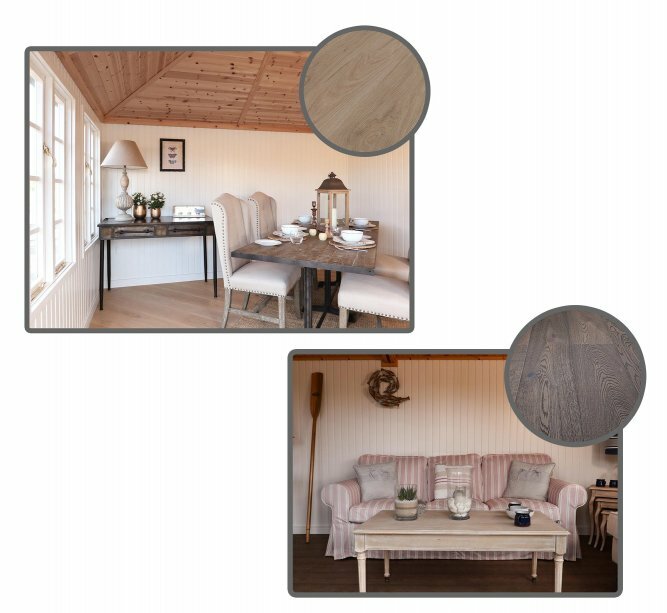 Other available shades are the warm colours of Shade Oak and Dark Oak, shown below in our Weybourne Summerhouse (left) and Holkham Summerhouse (right). The engineered flooring sits on top of the existing floorboards with a layer of underlay between the two: the oak veneer on top is an attractive and stylish look, with helpful sound absorption and insulating qualities. Choosing one of these colours is popular in buildings that will be used through most, if not all, of the year, because our customers love the aesthetic benefits, making them perfect for an outdoor entertainment space to show off to friends and family. 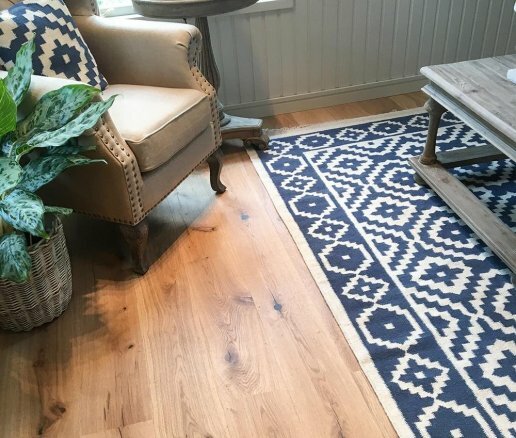 Hopefully, this article has provided you with a valuable insight into the different flooring types offered, and the pivotal role that it plays in your chosen garden building. If we have inspired you to look further into purchasing a building from us, please feel free to get in touch with us, or even visit one of our show sites which can be located here.